Numerous rumors have surfaced about Apple's future smartphone plans, and this time they have the ring of authority. If they prove true, an iPhone Mini really is inbound, and--among other news--this tells us Apple's success is only going to intensify, despite strong competition from Android. We've heard many rumors about an iPhone Mini over the years, some from insiders who even claim to have seen the technology, but the actual device has never surfaced. Presumably that's because Steve Jobs, or someone else high up on Apple's team, decided that the technology (or the market) wasn't yet mature enough to support it. The rumors resurfaced and intensified recently--and peaked this weekend, with an article in the Wall Street Journal that unmistakably suggests a smaller, next-gen iPhone is really en route. The reason these rumors make sense is clear: The WSJ's headline is all you need to see, really--"Apple Works on Line of Less-Expensive iPhones." Ever since it arrived the iPhone's high unit price has been problematic for many commenters and many consumers. Apple even got it hugely wrong at first in 2007, and had to quickly drop the price and offer a refund to some early adopters. That of course hasn't stopped the device from selling by the tens of millions--even in some overseas markets where its price isn't reduced by carrier subsidies. But the tide of sales has begun to turn against Apple, and Android phones are now outselling it in many places, including the U.S. This trend is likely to continue because Apple keeps its ecosystem all to itself, whereas Google shares its OS for free to partner manufacturers, its business model relying on income from embedded mobile ads (and thus a broad-spread of devices is in Google's favor). Android phones are available in a diversity of designs and prices, and some even go for free--something Apple simply can't compete with. It's tried, by keeping the previous-gen iPhone alive at a low price while the next-gen one ships, but consumers are aware of Apple's software tricks, and know their cheap devices won't necessarily run the hottest and greatest of apps. 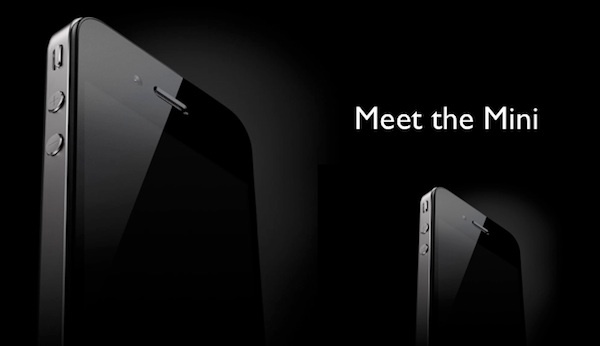 Hence the iPhone Mini (as we'll assume it's called, for now). The WSJ suggests it's about half the size of the iPhone 4, and will cost carriers about half as much--no doubt due to cost savings achieved in its production. This will mean an iPhone for 2011 on contract may be free, although you'll have to accept some limitations imposed by its smaller display compared to the "full size" unit. Assuming the device has all the same design cues that we're familiar with, and Apple doesn't underpower the unit to save a few extra dollars, it may even outsell the full-sized phone because it'll appeal to the masses to whom the iPhone's full price is a barrier. This is precisely the same business thinking that drives sales of the iPod Nano (and the Mini before it). A Mini iPhone would pitch Apple's device into direct competition with Google across the entire smartphone market, and possibly stem the flood of Android phones. Meanwhile, the WSJ is also reporting Apple's planning a revamp of MobileMe--its cloud-based ecosystem behind the iPhone and iPad--that will make it free, and more powerful. By pulling off this trick, the WSJ suggests the iDevices won't need so much on-board memory, as they'll simply be able to save, share and view content from the cloud (over 3G or Wi-Fi). This could save on unit costs, keeping the price down, and step neatly around the fact that Android phones have expandable memories via SD cards, which appeals to some types of user. If this also implies wireless access to your iTunes library (which may leverage the skills of streaming service LaLa that Apple bought last year, and make use of Apple's enormous, mysterious North Carolina data center) it also transforms the iPhone into the true mobile media device it's always been intended to be, challenging Google, Amazon and the horde of streaming music services that have emerged as competition. Some additional data on the cloud storage rumor suggests Apple may swap out all of the iPhone Mini's storage memory for cloud-based storage. Since it's the most expensive portion of the phone, and users now expect multiple-gigabytes of storage, this makes good sense, though it may limit the situations you try to use the phone in (in-flight, for one). Other rumors hint at an improved screen on the new iPhones that has "edge-to-edge" display powers, allowing Apple to compete with some classes of Android phone that have huge displays, and turning it into a portable media consumption device that's much more future-friendly. Lastly there's also a hint that Apple's including voice recognition powers in the phone, competing with Google's technology, appealing to limited-accessibility users and enabling all sorts of advanced gaming and app powers too. In other words, although Apple does not have a "revolutionary" new product on the table for 2011, it doesn't look like it will lose its smartphone crown any time soon.